I paid for John to go on a course, now he’s swanned off to a new job! 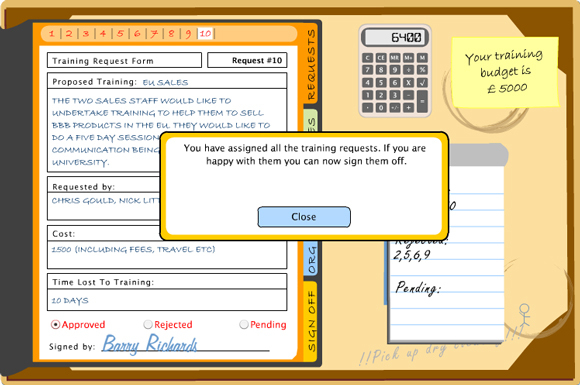 Balancing the needs, and desires, of individuals for training with the needs of a business is a difficult task. 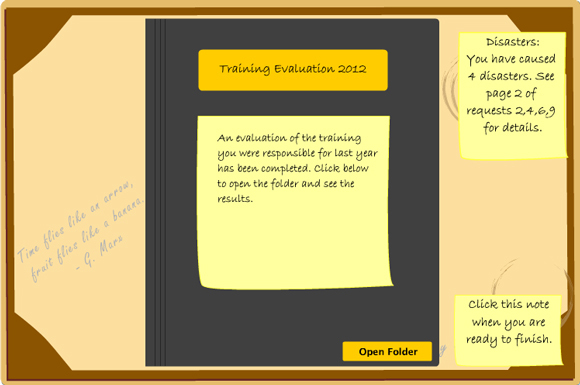 Refuse to provide training for staff, an you risk that they become disgruntled and possibly leave for another job. Provide training and you increase the individual’s market value, running the risk that their greater employability increases the risk of them leaving for a better job elsewhere. All the while you need to develop the business and grow the company. 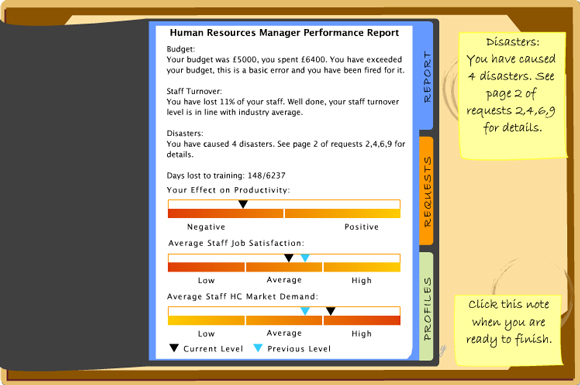 And don’t forget that you’ll always have a limited budget for staff development. Tricky stuff. Human Capital Theory is a simulation that helps students to consider the significance of human capital theory and its implications for individuals and organisations. 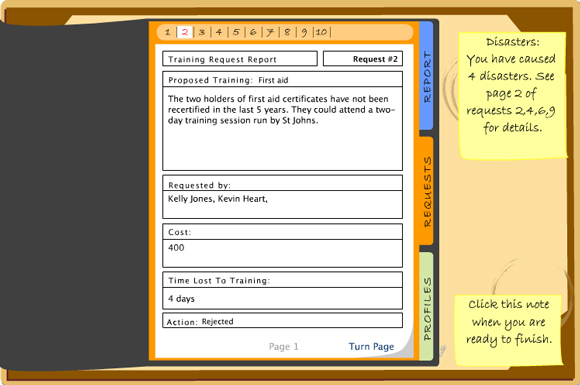 The learner takes responsibility for annual training and staff development requests at a fictional company. With a budget of £5,000 they must decide which requests the company should fund, based on a combination of human capital considerations and business outcomes. To help the learner make their decisions, each employee has a profile showing their productivity, job satisfaction and market demand. 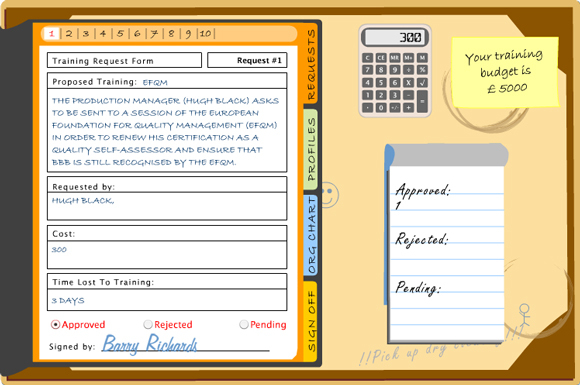 After all the requests have been approved or denied the learner is provided with a training evaluation report. This details the effect of the decisions on the business as a whole, including staff turnover and changes in oganisational productivity, job satisfaction and human capital market demand. A report on each request details the effect of approving/denying it, such as the employee leaving because their new skills have increased their market value. 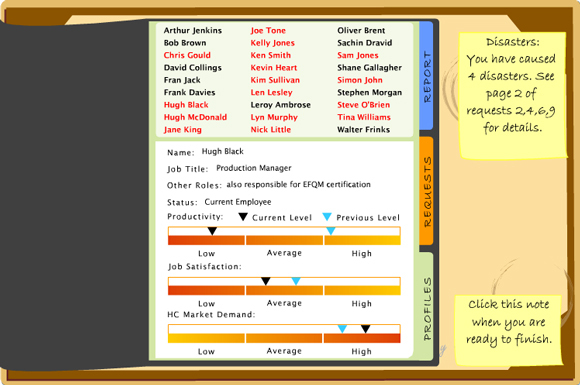 Staff profiles are also updated to reflect their new levels of productivity, job satisfaction and market demand. The organisational effects of the decisions are shown too. 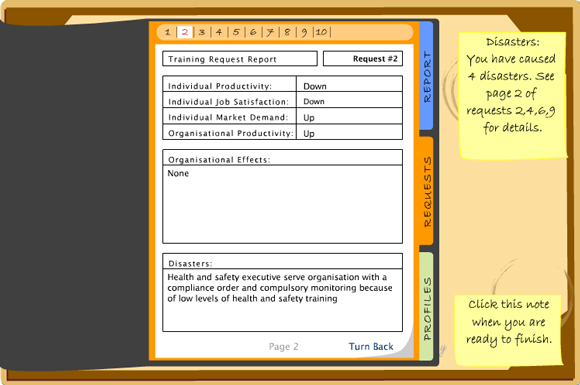 For example, denying Health and Saftey training requests can lead to the Health & Safety Executive serving a compliance order on the company as a result of low levels of Health and Safety training. Good, effective, engaging and quick to make its points. I liked this one a lot – I only caused three disasters! 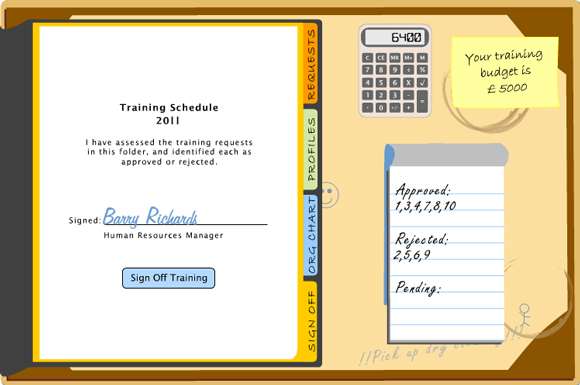 Human Capital Theory was designed and built in Adobe Illustrator and Flash. 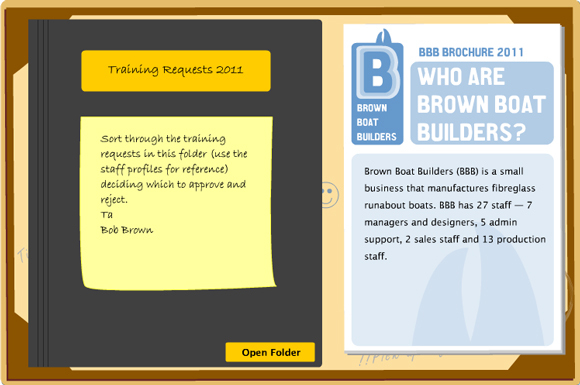 An XML file provides all the data for the organisation, staff and training requests. This allows the difficulty of the simulation to be tailored to the learners using it, and for the creation of multiple scenarios, extending the life, use of the learning object.